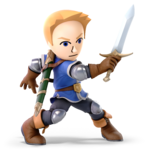 Many playable characters in Smash wield swords as their primary weapons. The following is a list of all swords used by playable characters as weapons in the Super Smash Bros. series. The Master Sword is a longsword from The Legend of Zelda universe. It has appeared in many games of the Zelda series as Link's most powerful sword, and is one of the few weapons capable of defeating Ganon. The backstory established in The Legend of Zelda: Skyward Sword shows that it was created from the Goddess Sword and is inhabited by the sword spirit Fi. It is generally found in the Pedestal of Time, although its location varies by game. In Smash, the Master Sword appears in many roles. The Master Sword is wielded by adult Link in all games of the Smash series; in SSB and Melee, it is based on its appearance in The Legend of Zelda: Ocarina of Time, whereas in Brawl and SSB4, it is based on its appearance in The Legend of Zelda: Twilight Princess; in Ultimate, it is based on its appearance in The Legend of Zelda: Breath of the Wild. Toon Link wields the Master Sword as well, based on its appearance in The Legend of Zelda: The Wind Waker; his version is shorter and weaker, but swings much faster. Mii Swordfighters can also wield the Master Sword as part of the downloadable content costume based on Link. In Melee's Adventure Mode, five pedestals with a Master Sword appear in the Underground Maze, indicating a fight against Link. There is also a Master Sword trophy in Melee. The Master Sword trophy in Melee. Link wielding the Master Sword in SSB. Link wielding the Master Sword in Brawl. Artwork of Link wielding the Master Sword from SSB4. Toon Link wielding the Master Sword in SSB4. Mii Swordfighters wielding the Master Sword. The unnamed sword popularly known as the SpaceWorld 2000 sword was wielded by Ganondorf in The Legend of Zelda-based SpaceWorld 2000 GameCube Tech Demo, being used in a short sword duel with Link. Despite the sword only appearing in a tech demo before, it appeared in Melee as part of one of Ganondorf's victory poses and returned in Ultimate as part of Ganondorf's down taunt and his new smash attacks. The sword did not appear in Brawl or SSB4, which used the Twilight Princess design of Ganondorf and the Sword of Six Sages from the same game. Ganondorf's SpaceWorld 2000 sword in Melee. Ganondorf's "Challenger Approaching" screen in Melee, featuring him wielding the sword. The Sword of the Six Sages is a longsword from The Legend of Zelda universe. In the backstory of The Legend of Zelda: Twilight Princess, the sword was originally used by the Sages in an attempt to execute Ganondorf. While the sword stabbed into him and left a glowing wound, Ganondorf was kept alive by the Triforce of Power he possessed, and he took the sword for himself before he was sealed into the Twilight Realm. When Ganondorf is revived towards the end of the game's plot, he uses the sword prominently in his final battle with Link. The sword is first given its official name in its appearance in The Legend of Zelda: Breath of the Wild as a legacy item unlockable through the usage of Ganondorf's Smash amiibo. In Smash, Ganondorf shows off the Sword of the Six Sages in his down taunt in both Brawl and SSB4. He would first use it to attack as part of the Warlock Blade custom move in SSB4. The sword did not appear in Melee or Ultimate, which use Ganondorf's Ocarina of Time design, and his sword from the SpaceWorld 2000 The Legend of Zelda tech demo. Ganondorf brandishing the Sword of the Six Sages in SSB4. Ganondorf using Warlock Blade in SSB4. The Kokiri Sword is a short sword from The Legend of Zelda universe. It is Young Link's starting weapon in The Legend of Zelda: Ocarina of Time, where it was retrieved from a treasure chest in Kokiri Forest on Link's way to see the Great Deku Tree at the beginning of the game. It also appears in The Legend of Zelda: Majora's Mask, slightly redesigned. In Smash, Young Link wields the Ocarina of Time version of the sword. Young Link wielding the Kokiri Sword in Ultimate. Young Link wielding the Kokiri Sword in Melee. Meta Knight carrying Galaxia in Ultimate. Galaxia is a branched sword from the Kirby universe. 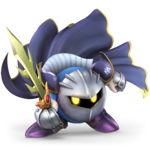 It is Meta Knight's signature weapon, and is used by him in all of his appearances. It was first named Galaxia in the Kirby: Right Back at Ya! anime series, and the name was adopted back into the main games. In Smash, Meta Knight wields Galaxia in all of his playable appearances. In Brawl and SSB4, it is also the namesake of his Final Smash, Galaxia Darkness. Meta Knight wielding Galaxia in Brawl. Meta Knight wielding Galaxia in SSB4. Falchion is a broadsword from the Fire Emblem universe. A regalia sword dating back to the original Fire Emblem: Shadow Dragon and the Blade of Light, Falchion is the signature weapon of the series' first protagonist, Marth. Falchion's sister weapon (or artifact, rather, as it's not intended to be used as an actual shield) is the Fire Emblem or the Binding Shield; they were both created together by the Divine Dragon Naga from her fangs. However, they do not have to be used together, as Marth's ancestor Anri uses Falchion alone. Marth wields the two weapons together in the Fire Emblem games. The sword reappears in Fire Emblem Awakening many centuries later, in the hands of the Ylissean royal family. Chrom, as Marth's descendant, inherited the sword (which has a significantly different design in said game). Lucina carries the same weapon from her future timeline, known as the Parallel Falchion due to an incomplete ritual being used to awaken it. In Smash, Falchion appears as the titular weapon of several characters. Marth wields Falchion in all of his appearances, based on its design in Mystery of the Emblem; this design is also used as the Fire Emblem series symbol. Marth's Falchion has a stronger sweetspot at the tip of its blade, which has been a consistent attribute in every Smash Bros. game he has appeared in. The Awakening design of the weapon is used by Chrom in his role as part of Robin's Pair Up Final Smash, by Mii Swordfighters wearing the Chrom costume, and by Chrom himself in his playable appearance in Ultimate. Lucina uses the Parallel Falchion as her weapon of choice. Chrom's Falchion and and Lucina's Parallel Falchion lack the tipper sweetspot of Marth's Falchion and instead have an overall consistent damage output throughout their blades. The Fire Emblem series symbol. Marth wielding Falchion in SSB3DS. Chrom carrying his Falchion in his trophy in SSB4. A Mii Swordfighter wielding Chrom's Falchion. Lucina wielding the Parallel Falchion in her SSB4 splash screen. Chrom wielding Falchion in Ultimate. The Binding Blade, also translated as the Sword of Seals (封印の剣), is a regalia sword from the Fire Emblem universe. The titular sword of Fire Emblem: The Binding Blade, the Binding Blade was the second sword wielded by the legendary Hartmut of the Eight Generals, the founder of the militant nation of Bern in Elibe. It was used to seal away the Demon Dragon Idenn and end the Scouring, a war in which humans fought and exiled dragons to another dimension. Late in The Binding Blade, the weapon is awakened by the Fire Emblem and reacts to Roy, promoting him into a Great Lord. In Smash, the Binding Blade is wielded by Roy in all of his playable appearances. In a similar vein as Marth's Falchion, Roy's Binding Blade has consistently featured a "reverse" sweetspot at the base of its blade in every appearance, necessitating him to fight much closer to his opponents. Official artwork of the Binding Blade from Fire Emblem: The Binding Blade. Roy wielding the Binding Blade on his Classic Mode ending image in Melee. Roy wielding the Binding Blade in SSB4. Roy wielding the Binding Blade in Ultimate. Ragnell is a two-handed regalia sword from the Fire Emblem universe. In Fire Emblem: Path of Radiance and Fire Emblem: Radiant Dawn, Ragnell is a holy blade blessed by the Goddess Ashera and wielded by Ike, along with its partner, Alondite, which is wielded by the Black Knight. Ragnell and Alondite clash against each other, along with their respective wielders, in their rivalry throughout both games set on Tellius. Both swords are the most powerful in the game and have ranged attacks. In the ancient past of Tellius, Ragnell and Alondite were the twin blades of the Beorc warrior woman, Altina. In Smash, Ragnell is wielded by Ike in all of his playable appearances. As a "testament to his strength", Ike wields the two-handed Ragnell with only one hand, granting his attacks significant strength but low speed. Ike wielding Ragnell in Brawl. Ike wielding Ragnell in SSB3DS. Ike with Ragnell in Ultimate. A Levin Sword is a magic sword from the Fire Emblem universe. Debuting in Fire Emblem: Shadow Dragon and the Blade of Light, Levin Swords are used to cast thunder magic, and have appeared in many games of the series with varying designs. In the Fire Emblem series, the Levin Sword can be used to attack from afar, but this is not present in SSB4. Additionally, the Levin Sword in SSB4 is considerably shorter compared to its appearance in Fire Emblem Awakening. In Smash, Robin uses a Fire Emblem Awakening-style Levin Sword for smash attacks and smash attack-like aerial attacks. Following its original elemental traits, the Levin Sword deals electric damage. After a certain number of uses, Levin Swords will break, referencing the Fire Emblem durability system. A broken Levin Sword will be dropped and shatter after a few seconds, but Robin or any other fighter can pick it up and use it as a basic throwing item before it disappears. Robin (female) wielding a Levin Sword in SSB4. Robin (male) wielding the Levin in his SSB4 splash screen. Robin (male) carrying a Levin Sword in Ultimate. Robin (female) carrying a Levin Sword in Ultimate. A Bronze Sword is a very basic, weak sword from the Fire Emblem universe. Introduced in Fire Emblem: Radiant Dawn, Bronze Swords are inexpensive, have a very low weapon rank and high durability, but are quite weak compared to other weapons. In Smash, Robin will use a Bronze Sword for any sword-based moves that do not use a Levin Sword. This includes Robin's jab, tilts, dash attack, neutral aerial, and any aerials performed normally. Robin also uses a Bronze Sword for smash attacks should the Levin Sword normally used for such attacks be broken and not have respawned yet. Despite being breakable in Awakening, Bronze Swords are unbreakable in Smash. Like the Levin Sword in SSB4, the Bronze Sword is considerably shorter compared to its appearance in Fire Emblem Awakening. Male and female Robin carrying Bronze Swords in SSB4. Yato (夜刀, Night Blade) is a regalia sword from the Fire Emblem universe. In Fire Emblem Fates, it is Corrin's signature weapon and is capable of transforming into many variations over the course of the game, some of which are dependent on the plot path chosen. In Smash, Yato is Corrin's main weapon. The form wielded is the ultimate form of the Yato, called Omega Yato, which is exclusively available in the third plot path, Revelation and in the DLC chapter Heirs of Fate 6: Lost in the Waves. Corrin (male) wielding the Yato in SSB4. Corrin (female) wielding the Yato in SSB4. Male Corrin with Yato in Ultimate. Female Corrin wielding the Yato in Ultimate. The Monado is a mythical weapon from the Xenoblade universe. It is an energy blade, with the red shell opening up to produce a long beam of blue light. The Monado begins Xenoblade Chronicles as the Homs' ultimate weapon against the invading Mechon - it cannot harm Homs, whereas it is the only known weapon that can damage the Mechon. However, it appears to have a mind of its own; Dunban is the only one that can successfully control its power, and even then, he eventually loses the use of his right arm due to it. When the Mechon later attack Colony 9, Dunban can no longer use it despite trying, and Shulk ends up taking it instead - finding that he can use it with no ill effects. From there, Shulk uses the Monado as his only weapon. As his adventure progresses, he discovers that it hides additional battle arts and provides him with quick visions of the future that he must take action to avoid. Over the course of the adventure, the Monado evolves to grant Shulk additional strength when he most needs it. Ultimately, Shulk and his party discover the deep and complex connection between the Monado and the nature of the world. In Smash, Shulk wields the initial form of the Monado as his primary weapon, and utilizes its Monado Arts. Due to its beam nature, the Monado grants Shulk excellent disjointed range, and makes him the fighter with the longest disjointed weapon in the Smash Bros. series. The premonitions are also used as his down special as a type of counter move. A stylized depiction of the Monado is also used as the Xenoblade series symbol, matching how it was stylized on the loading screens of Xenoblade Chronicles. Shulk wielding the Monado in SSB4. Shulk wielding the Monado in his SSB4 splash screen. Shulk carrying the Monado in Ultimate. The Buster Sword is an immense broadsword from the Final Fantasy universe. Debuting in Final Fantasy VII, it is Cloud Strife's trademark weapon, and was wielded before him by Zack Fair and Angeal Hewley. The Buster Sword has become an iconic design element for both Cloud and Final Fantasy VII generally due to its massive size. The Buster Sword is wielded by Cloud in most of his appearances, and has appeared in other Final Fantasy media as well. From tip to handle, it is approximately five to six feet long, with a single-edged large blade approximately one foot wide. There are two holes near the handguard, variably said to be Materia slots, or where Cloud clips the sword onto his back. In Smash, Cloud wields the Buster Sword as his primary means of attack. When using Cloud's costume based on Final Fantasy VII: Advent Children, the Buster Sword is replaced with the combined Fusion Swords from that film, with no difference in function. Cloud carrying the combined Fusion Swords in SSB4 as part of his Advent Children costume. Cloud wielding the Buster Sword in his splash art. Cloud carrying the Buster Sword in Ultimate. Cloud carrying the combined Fusion Swords in Ultimate as part of his Advent Children costume. The standard sword in Ultimate. Standard Outfit: A basic sword with a golden hilt, loosely resembling Marth's Falchion. Cybernetic Suit: A light blue futuristic sword. Business Suit: A long, black sword. SSB T-Shirt: A multi-colored sword loosely resembling the Beam Sword from SSB4. Samurai Armor : A katana. Plate Armor : A knightly sword. Neon Suit : A glowing, light blue futuristic sword resembling the Beam Sword from Brawl. Hoodie : A glowing sword with a blue hilt. Maid Outfit : A broom. Link Outfit and Champion's Outfit: The Master Sword. Dunban Outfit: Dunban's Homs Sabre. Chrom Outfit: The Awakening design Falchion. Takamaru Outfit : Takamaru's ninjatō. Lloyd Outfit : One of Lloyd's Twin Blades. Zero's Armor : Zero's Z-Saber. Hunter's Mail : The Hunter's Knife. Rathalos Mail : The Blazing Falchion. Gil Outfit : Gil's Excalibur. Lip Outfit : Lip's Stick. Yiga Clan Outfit : A Vicious Sickle. Vince Outfit : Vince's painting brush. Rex Outfit : Pyra's Aegis Sword. The standard sword in SSB4. Wielding the Black Knight's Alondite. Wielding one of Lloyd's Twin Blades. Wielding Yiga Clan's Vicious Sickle. Mega Man's Flame Sword forward aerial in SSB4. The Ultra Sword, used by Kirby in his Final Smash. Flame Sword, Sword Man's weapon from Mega Man 8, which is used in Mega Man's forward aerial. Greninja's Smash-original water-based katanas (in SSB4) or kunai (in Ultimate), used for its smash attacks and forward aerial. Pit's Palutena Bow and Dark Pit's Silver Bow, both of which can split into bladed weapons. A Phantom's sword, used by the Phantom summoned by Zelda's Phantom Slash. Sheik's dagger, used in her Final Smash, Sheikah Dance. Joker's dagger, used in his standard attacks. Ganon, the Demon King's twin greatswords. The Beam Sword and Killing Edge items. Assist Trophy characters who attack with swords or similar weapons (Brackets are named weapons): Alucard (Crissaegrim), Black Knight (Alondite), Ghirahim, Gray Fox, Kat & Ana, Lyn (Manni Katti), Magnus, Saki Amamiya, Samurai Goroh, Takamaru, Zero (Z-Saber). Assist Trophy characters who carry swords but do not attack with them: Isaac, Sablé Prince. Boss characters who attack with swords: the blue side of Duon, Master Edges, Ganon. Common enemy characters who attack with swords: Sword Primid, Armight, Darknut, Stalfos. The two swords in the Ironworks Chamber of Kalos Pokémon League. Kirby wields the Ultra Sword in SSB4. Greninja's katana formed from water in SSB4. Pit splits the Palutena Bow in SSB4. Dark Pit's split Silver Bow SSB4. The Phantom's sword in SSB4. Ganon, the Demon King, wielding his swords in Ultimate. The Beam Sword's appearance in SSB4. The icon for the Sword equipment type in SSB4. Gray Fox's sword in SSBB. Kat & Ana's swords in SSBB. Magnus wielding his sword in SSB4. Saki wielding his Cannon Sword in SSBB. Samurai Goroh wielding his sword in SSBB. Isaac's sword on his back in SSBB. The Sablé Prince's sword at his side in SSB4. Duon's blue side slashes forwards with its sword. A Sword Primid attacks with its sword in SSBB. An Armite throws its sword in SSBB. A Darknut carries its sword in SSB4. A sword-wielding Stalfos in SSB4. The massive swords that appear in the Ironworks Chamber in SSB4. Close examination of textures for the Binding Blade in Melee shows that the text "©HAL LABRATORY.INC" [sic] is included in the file. It is not known why the signature is there. The Sablé Prince's sword is fully modeled and textured in SSB4 despite never being removed from his sheath and thus not normally visible to the player. Looking at the design of the sword in the game's data reveals that it accurately matches the design seen in concept art for Kaeru no Tame ni Kane wa Naru. This page was last edited on April 18, 2019, at 12:10.